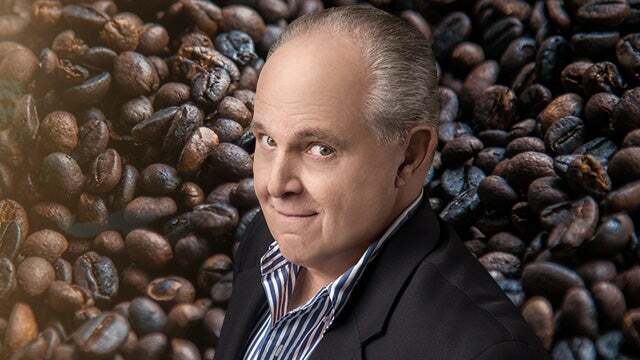 RUSH: Let’s go to the audio sound bites on our African-American guy who asked for reparations from Starbucks because of what happened with a couple of black customers. By the way, if this is not typical, Philadelphia’s police commissioner has apologized to the two men arrested at Starbucks. His name is Richard Ross. He apologized today after he defended the police officers’ actions for arresting two black guys at Starbucks. Now, folks, we live in a great country at risk in a dangerous world, and there are really, really big things going on. And I think this is a microcosm of what’s wrong with the country, this touchy-feely, emotional attachment to things. Three hundred plus million people live in our country. We have major, important things that need solutions. And we have now spent a week going over the details of two people, two guys who were not treated the way they thought they should have been treated at a coffee shop. And we’re turning ourselves upside down, and we’re deciding whether or not we are a decent country or not because of this. It’s irrelevant! It’s small ball! It’s a distraction! But to the left it’s everything. And now we got the police commissioner apologizing? He’s probably trying to stave off a lawsuit. But here’s the setup. 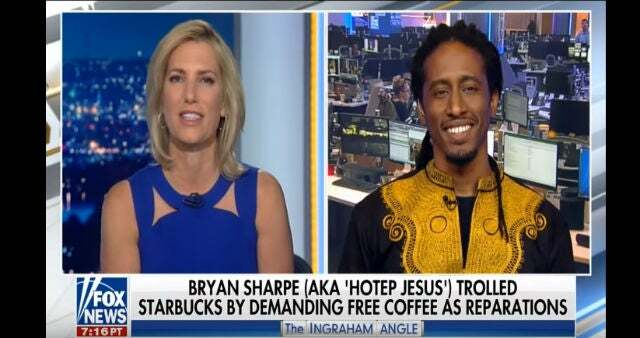 This is Monday at an unidentified Starbucks store, a guy we now know to be comedian Bryan Sharpe, filmed himself walking in and asking a barista for a free coffee as reparations for the African-American men being arrested in Philadelphia. SHARPE: I heard you guys don’t like black people. SHARPE: So I wanted to get my Starbucks reparations. SHARPE: Yeah, I need, I need a free coffee. SHARPE: Where was that, Arizona? RUSH: (laughing) This is justice. This is justice. That whole term has been bastardized and blown to smithereens now to mean all kinds of things it doesn’t. Dawn, are you getting bored in there? No, I wouldn’t blame you if you were. This guy’s funny. But the whole idea that we’re taking time here to talk about, okay, so couple guys got arrested at Starbucks, big whoop. We turn it into a week long story, the purpose of which is so the left can trash America, again. And I can understand you being fed up with it. But this is a different angle. This is a guy trolling ’em. This is a conservative black comedian named Bryan Sharpe, and he’s throwing it right back down their throats. SHARPE: I am sick and tired of liberals using black people and making us look like victims, making us look soft with their liberal dogma. It is disgusting! The other thing I hate about liberals is, if you’re a black man — as I am — in America, they will not hand you a microphone unless you follow the liberal narrative. And I said, “You know what? I bet if I go into Starbucks and I follow a liberal narrative, I’ll make the news,” and, voila! Here I am. SHARPE: You’re gonna get enemies, and you have to learn how to use ’em. I know how to use them. So I embrace the hate. I embrace it ’cause it gets balanced out with love. But all the people that hate? They’re just brainwashed by liberals. That’s all it is. They’re afraid to think for themselves. 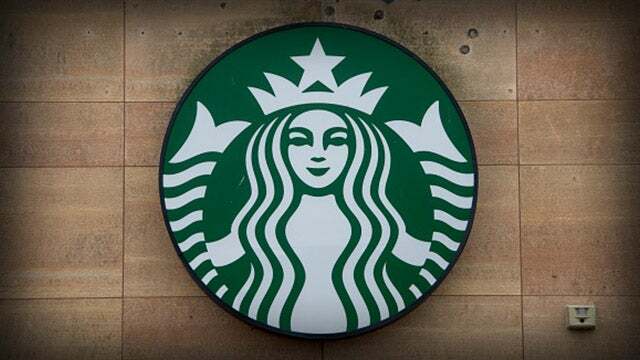 COHEN: We approached Starbucks and suggested that we engage in mediation with a retired federal judge in Philadelphia, and they agreed to that proposal and we are still involved in that process. That process requires confidentiality. ROBINSON: I want to make sure that this situation doesn’t happen again. So what I want is for a young man or young men to not be traumatized by this and instead motivated, inspired. ROBERTS: (whispering) And what do you want, Rashon? NELSON: So, you know, take this opportunity as — as a steppingstone, you know, to really stand up and, you know, show your greatness. And that you are not judged by the color of your skin as our ancestors were or anyone else. Just really taking those actions and putting ’em in a place and, you know, help people understand that it’s not just a black people thing. This is a people thing. And that’s exactly what we want to see out of this, and that’s true change. So put action in the place and stop using words. RUSH: There you go. (interruption) You’re asking the wrong pers… (interruption) Well, you want to know what it means? “Well, it’s a people thing. That’s exactly what we want to see out of this. And that’s true change. So put action in…?” (interruption) The thing is, Starbucks is engaging all kinds of action. 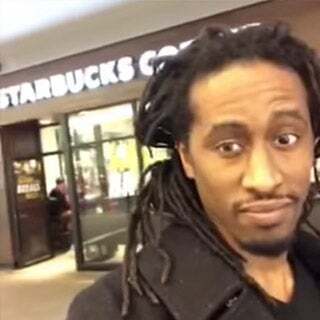 They gave a guy reparations coffee for the rest of his life. The CEO’s willing to meet with a federal judge to be mediated out of business if that’s what it takes. (interruption) What do I think they’ll end up with? (interruption) Oh, yeah, they’ll get your own franchise. They’ll get your own franchise and somebody else to run it for ’em. The lawyer may get the franchise. These guys get the profits. I don’t know. But, yeah, they’ll be offered a franchise. In fact, they’ll probably be offered a franchise at a place that otherwise there wouldn’t be a Starbucks. So he’s gonna take it on their neighborhood. Starbucks can say they’re spreading far and wide, helping out all peoples, so forth. ROBERTS: This is a moment where there has to be change. You know, Michael? STRAHAN: Two minutes. I mean, and as you said — he just said in the piece — actions, not just words. And I think that’s what they’re looking for to see it, really. ROBERTS: You just can’t label it on Starbucks. RUSH: All right. So that was Stephanopoulos, Strahan and Robin Roberts analyzing what they had just put on the air with the two perps and their lawyer. (interruption) Well, not “perps.” The victims. Okay, the victims. Whatever, the two arrestees. I’m not judging. I’m just trying to tell people who we’re talking about here. Robin Roberts. “This is a moment where there has to be change.” Robin, it’s a coffee shop. Starbucks! It’s a quintessential leftist place. How can this even happen there, Robin? Come on! It’s Starbucks! Starbucks! Every one of them is its own little liberal utopian enclave, I thought. Where everybody’s equal, everybody’s free, everybody’s happy. Except everybody has to pay. Liberals are not used to that. But still. Aside from that, everybody’s happy and everybody’s hunky-dory. Everything liberals believe in is supposedly encompassed inside every Starbucks. How can this happen there? You would think this kind of stuff would happen at Chick-fil-A, right? But no. It happens at Starbucks. “Society, yeah,” Strahan says. Robin Roberts, “This is… It’s… You just can’t label it on Starbucks.” So no, see? It isn’t Starbucks, even though it is. It’s all of America. They gotta bail Starbucks out. They have to save Starbucks. At Starbucks, this kind of thing should never happen. Nobody in Starbucks should ever be treating minorities this way or even thinking of them this way. So of course since it can’t happen in Starbucks, it really didn’t. This happened in America where this just happened to be a Starbucks taking up space.